A multi-talented, multifaceted personality who can make you laugh, cry and scared at the same time! The one and only Pushkar Shrotri. He has been in the Marathi Performing arts industry - theatre, movies, Television for years now and has been a successful actor, presenter, VJ, compare, stand up comedian! You name it and he has done it! 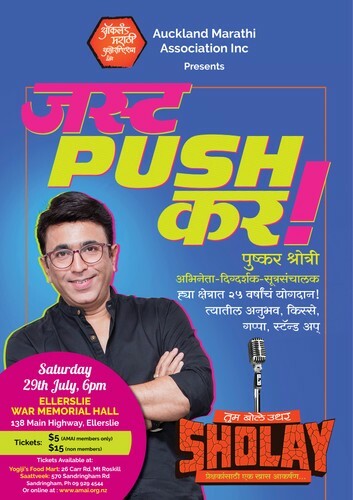 Aucklanders will get a chance to come and see him perform live with his show Just Pushkar on 29th July 2017 So don't miss this chance to see him live in action with some unique presentations, classic timing and laugh a riot comedy all rolled into ONE - Just Pushkar. So push the button and buy your tickets now. Don't miss out, limited seating so book now!